I’ll be doing a fair amount of work in Python in the next few months, so I decided to sit down and get a good dev environment going. First on my laptop (32 bit is easier to deal with), then on my desktop. They’ve improved the installer since I last used it, so it was deceptively simple. No more messing around with config files, whee! And onto the third and final thing, which is also the most difficult: Getting Python up and running with pip installed & working. I’ll split this into two parts: getting Python, and getting pip working. Install setuptools. 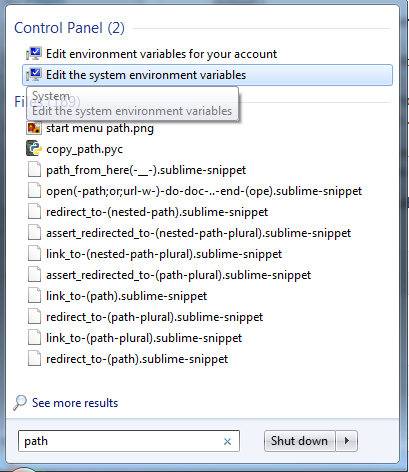 You can follow the defaults, just make sure you install to the correct directory – where you installed Python. This should be auto-detected though. For bonus points, and to get Python to run without having to prepend the directory where Python is installed to every command you run with Python, append the Python directory to your environment PATH variable. 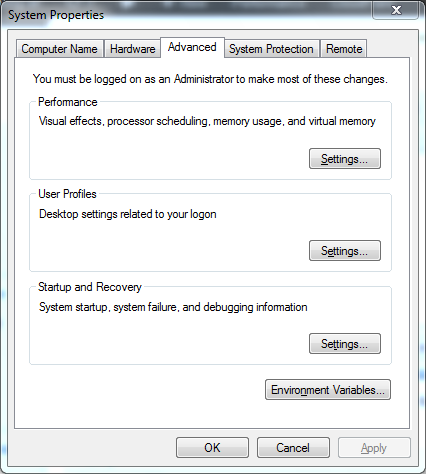 Select the “Edit system environment variables” option. Not the one with “Your account”. I’ve skipped a bit, but you want to scroll though the box on the bottom to find the Path variable. When you’ve found it, either double click on it, and single click to select it, and press Edit. When the screen comes up, hit “End” on your keyboard to jump to the end of the line, then add a semi-colon (which is the ; symbol, if you don’t know), and paste the directory where you installed Python. Or type it. Copy & Pasting directly from an Explorer window is less error prone, so that’s what I do. Because it’s a system variable, it’ll only take global effect when you restart your computer. If you just want to use Python in Powershell though, just open a new Powershell instance. You can verify that Python’s present in your Path by typing $env:Path and looking at the end of the line that gets printed. 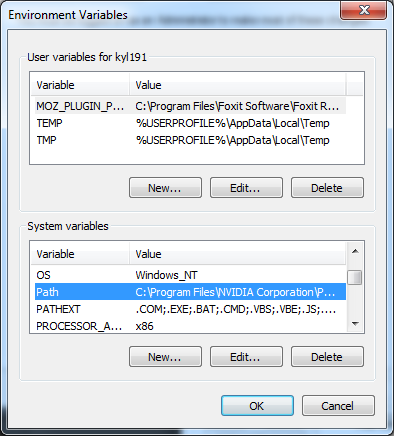 This entry was posted on September 14, 2012, 7:46 pm by Kyle Lexmond and is filed under Programming. You can follow any responses to this entry through RSS 2.0. You can leave a response, or trackback from your own site.